If you are a little league coach I don’t have to tell you that infield drills for a youth team are a must. That is why we have several on our site. Young players typically play many different positions. And each position is unique in regards to its responsibilities. So to properly teach your players, infield drills are going to occupy a lot of time. They need to learn not just where to go and who to throw to, but how to do that automatically. And that will take many reps for each infielder. There is no time on the field to be thinking after the ball has been put into play. Players needs to think before the pitch is thrown what they are going to do if the ball is hit to them, or another fielder. And even when the ball is not in play, there isn’t a lot of time to decide what to do. So practice your infield drills over and over and be sure and rotate in as many players as possible. Coaching is all about eliminating mental errors. And infield drills seem to have the most mental errors. The following drill is pretty simple to set up and run. And it will happen at least once in every game. And when it happens and your team does not execute properly, it will drive you nuts. So, to protect your sanity, practice this drill more than just a couple of times in the preseason training. And keep working on it during the season. The hot box drill is another one of the great infield drills. This drill only takes five or six players, so the other half of the team could take soft toss hitting or such. Runners are involved in this drill, so be sure and have them wearing helmets. Many kids may have played this game at home and that shows they love this drill. Because they may have played this before, give out the instructions two or three times. We want them to learn to handle this drill the correct way, not the backyard way. After I explain the drill, then I’ll explain adding a runner to third base. The drill starts with a pitcher, a first and second baseman and a shortstop, and a runner on first. The pitcher throws over to first like a pick off and the runner is told not to go back to the bag. Instead, he is instructed to get into a run down. The first baseman runs him towards second base, staying a step or two out of the baseline so his throw won’t hit the runner. The shortstop goes to second for the throw. The first baseman should throw plenty early before the runner gets to second. If we do not get the runner out, we at least want him back on first. When the first baseman started chasing the runner to second, the pitcher should high tail it to first. The first baseman has now thrown to the shortstop and the shortstop chases the runner back to first. Again, he stays to the outside of the baseline so his throw won’t hit the runner. The pitcher is on first base. The shortstop throws to the pitcher just before the runner slides in. The tag is made and the runner is out. That is a perfect execution of a hot box drill. It is a drill that takes many times to learn. But it is well worth the time and energy spent to get it right. 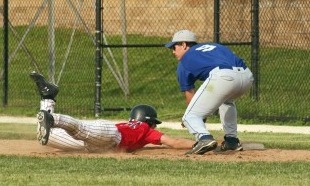 Nothing worse than having a runner picked off first and then he makes it to second safe. And there is nothing wrong with tagging the runner out at second with that throw from the first baseman. Just be sure your first baseman does not wait too long. Once your team has that youth baseball drill down pat, let’s add a little more fun to it. Add a runner at third base, and place a third baseman on third and a catcher at home. Start the above hot box drill. The runner on third waits to go until he thinks he can make it safety. The catcher’s job is to communicate with the other infielders when the runner heads home. The infielders’ job then is to make an accurate throw home and get the runner from third out. This additional runner to the hot box drill makes the drill a lot tougher. You will see a lot of high school teams struggle with this situation in games. So if your team is 12 or 13, go easy on them with this addition. It is not an easy out to get. I hope this article help with your infield drills. Sometimes in the middle of the season you need some new ideas for practices. Be sure to look at some of the other great youth baseball drills on this website. Good luck in your games.